As per 2014 Food waste survey, more than a third of all the food produced in the U.S. is simply thrown in the garbage. Several institutions, offices, and residents are aware of the food wastage issues but people refuse to admit it. 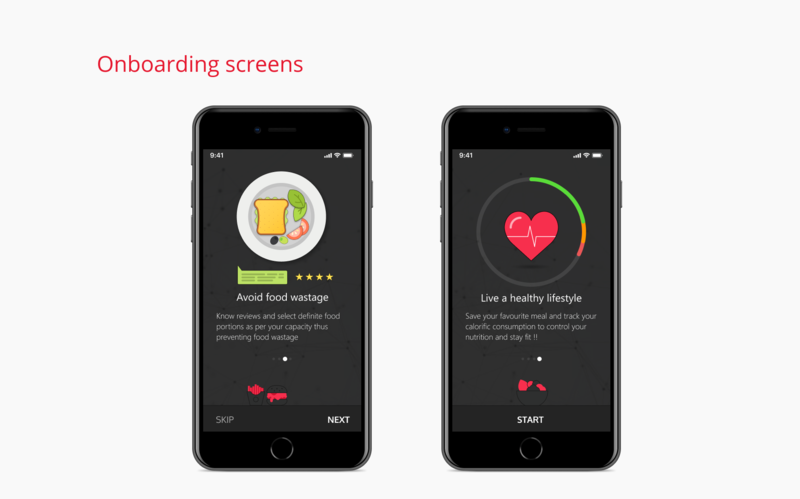 There have been several initiatives recently to prevent food wastage by donating food to pantry and educating people about food preservation through various means. But there is a huge gap between the amount of food produced in institutions and the total quantity of the food consumed by the users leading to massive food waste. My Role: I was a part of User research process and assisted the team in defining appropriate solutions for the problem space through research methods. I took the lead as the Product designer and designed high fidelity screens for kiosk and mobile. 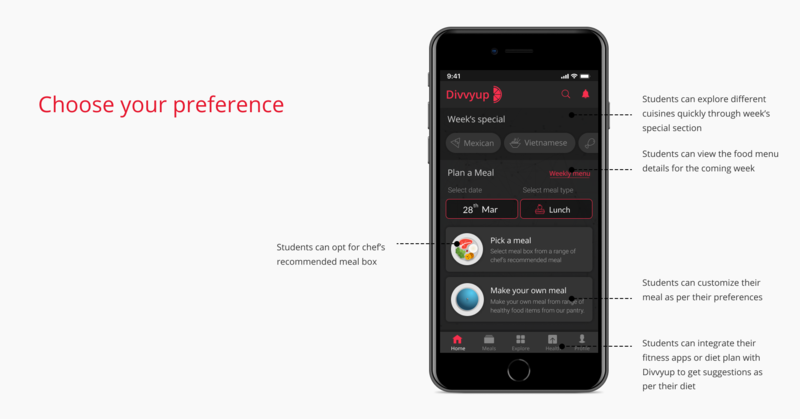 We came up with a system that could be easily scaled to large screen interface at tower dining and a mobile device to assist students in customizing their meal as per their preferences. Through initial literature study, we found food wastage to be a crucial problem that exists across all domains viz. residential, commercial, institution, offices, hospitality, etc. We decided to narrow down our problem space constrained to Indiana University at Indianapolis. We focussed on the institution to understand the issue on a larger scale and to think of the solutions that can create an impact on the Millenials of different origin, studying at one place. 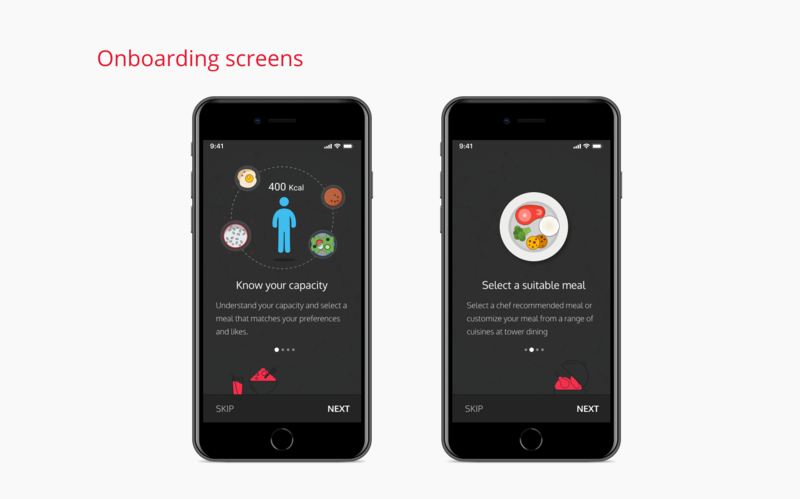 After setting up the context and target users, we created survey forms focusing on questions that would help us understand user behaviors, their understanding about food wastage and their eating practices in buffet style restaurants and tower dinning. We received overwhelming responses from 30 participants when we distributed the survey forms among the University students. 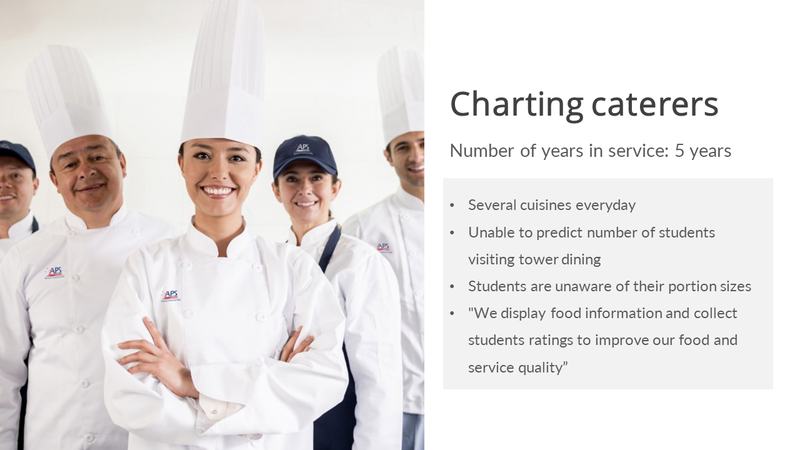 To verify if students rarely throw food at tower dining we decided to conduct an observation session at tower dining. 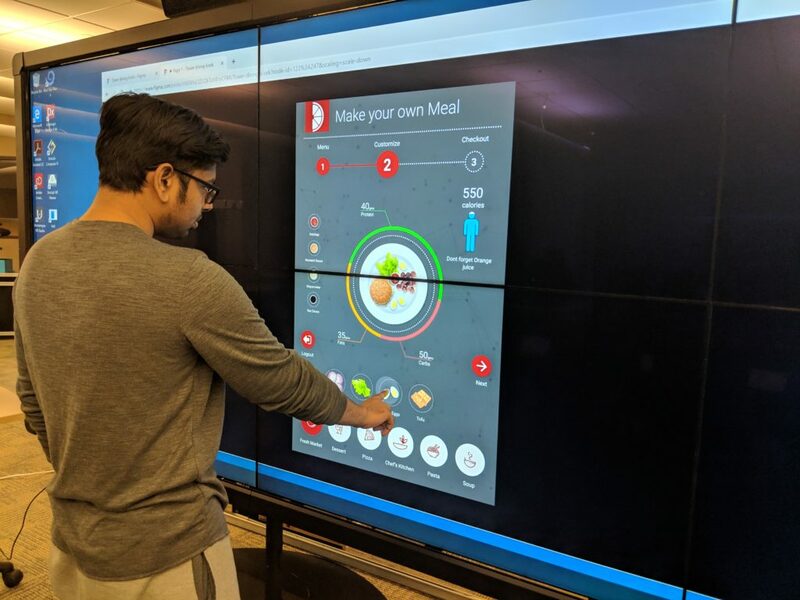 The observation session also provided us with many interesting insights that affected the user’s choices while taking food and also gave us a picture of how tower dining create an awareness about preventing food wastage among students. After the observation session, we conducted a semi-structured interview session with chef from a local buffet-style restaurant and principal chef at Tower dining to know more about the demand-supply concept, production of food, the reason for food wastage, people’s eating practices and some of the limitations in the buffet-style system. 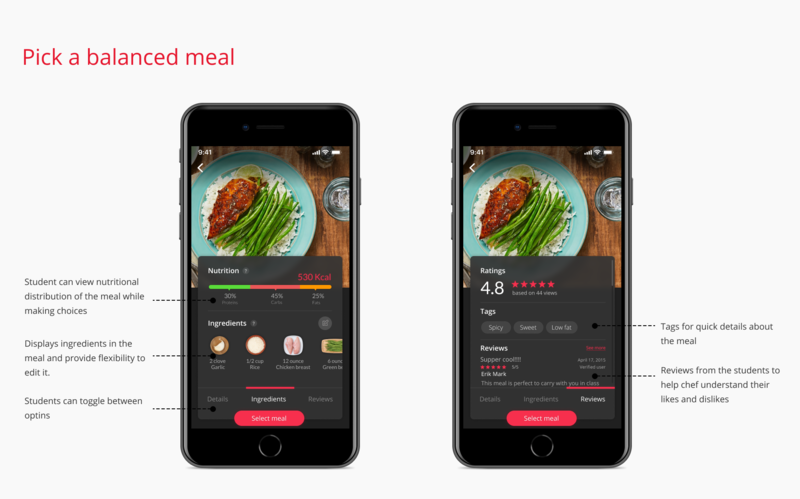 We were also keen to understand why people prefer made to order restaurant compared to the buffet-style restaurant. We started gathering data and insights from the surveys, observation, and interviews and conducted affinity mapping to categorize the data and draw user requirements. Next, we started prioritizing the requirements such that it would assist users in achieving their end goal. 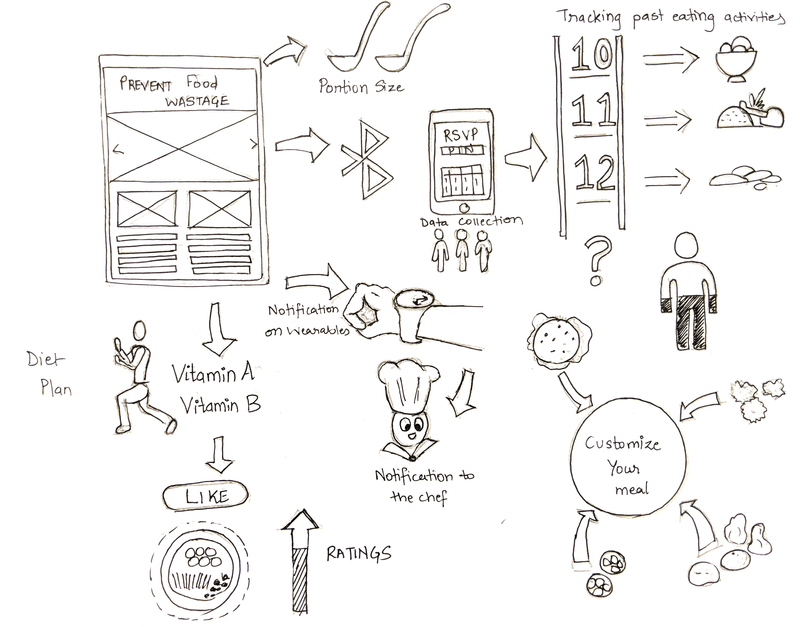 Affinity diagramming helped us to identify key user requirements for the problem space and thus tackling the problem of food wastage. 2. Students often find it time consuming to go over each counter and randomly select food that looks good which is one reason for food wastage i.e. they need to know about the taste, ingredients, allergens if any. 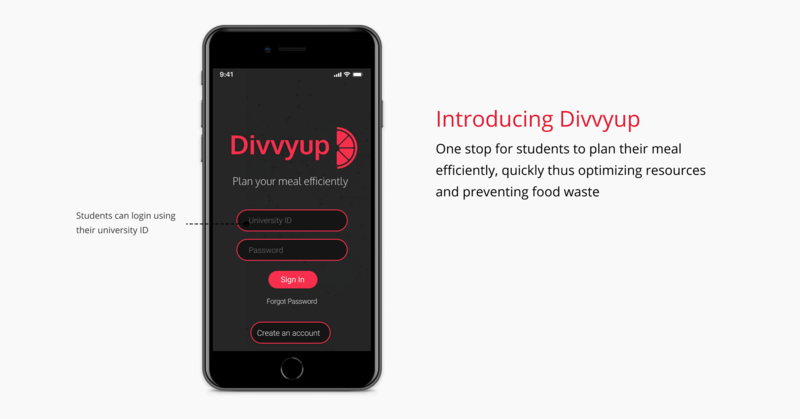 How might we design an experience to assist Tower Dining at IUPUI in reducing food wastage? 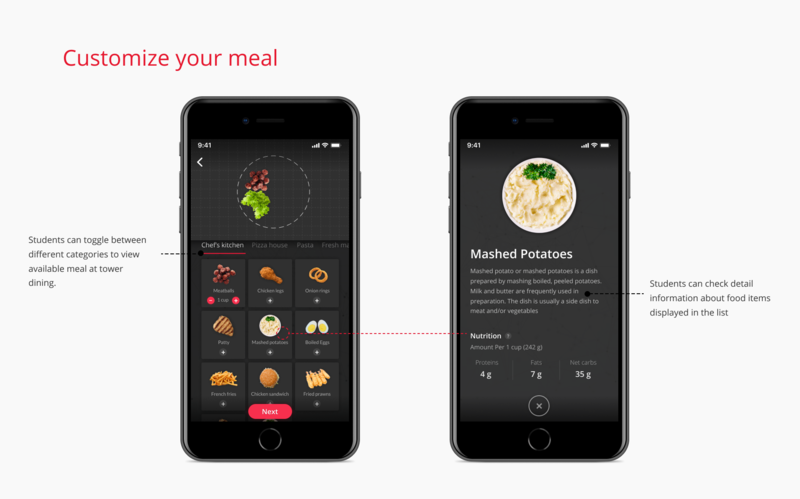 How might we assist students in making a perfect choice for their meal ? 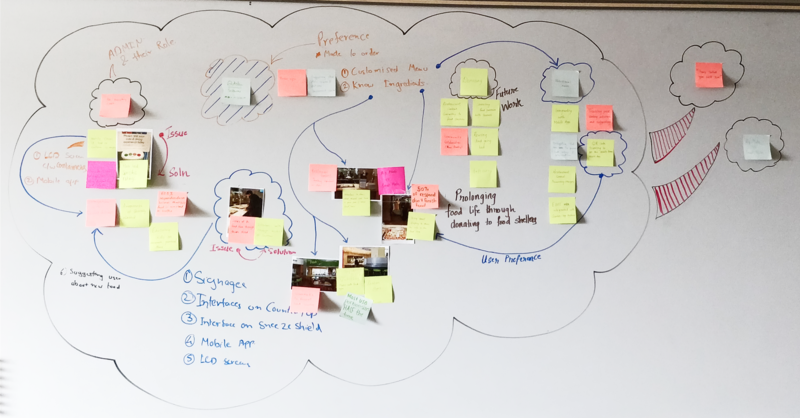 Once we came up with the key areas of concerns we sketched out customer journey of the students and listed several pain points during the user journey. We brainstormed on the opportunities at these stages which helped us during the ideation stage. In the following scenario, we found students to follow different routes to learn about meals and to decide whether to eat at tower dining. 4. Students opt for small portions of food and one at a time making sure they don’t waste food. We brainstormed on the opportunities at marked stages to explore suitable solutions during the ideation stage. We started ideating solutions for the problem space considering various parameters and insights drawn from the earlier stages. 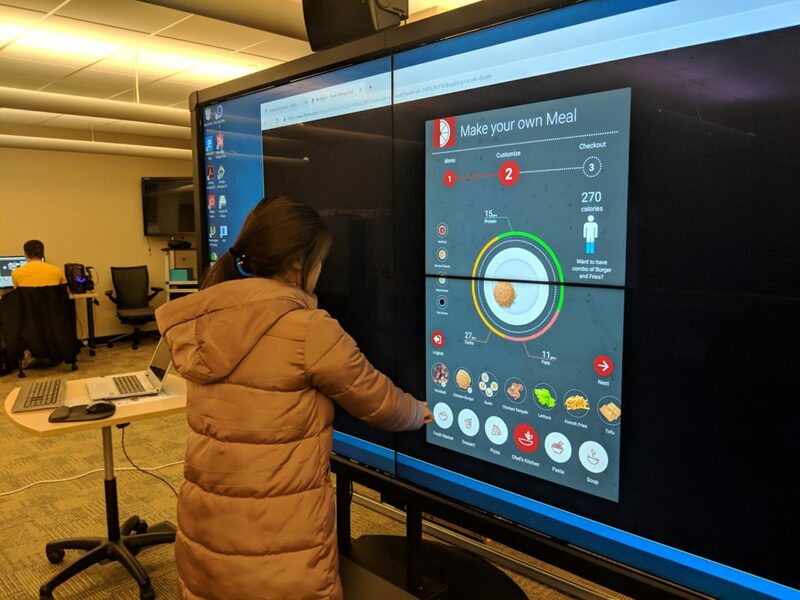 We came up with an educational app, smart countertop, smart refrigerator, Large screen kiosk, a smart screen on food counters, an AR app, food donation app, smart plate. 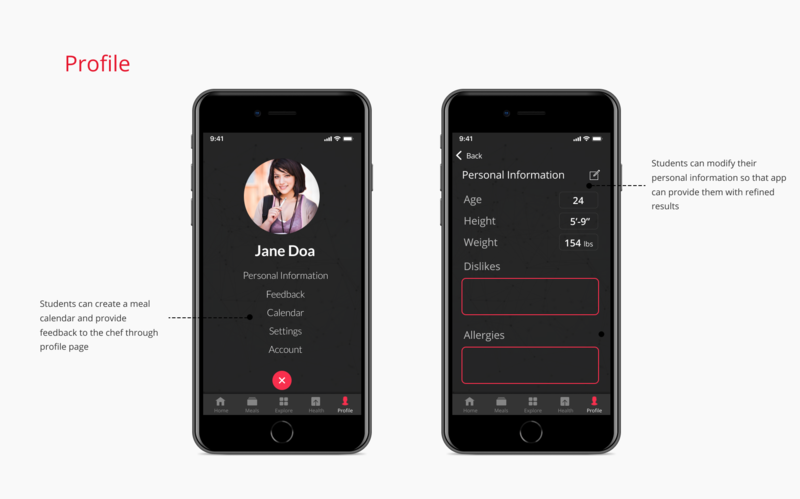 We decided to move ahead with three of our choices to align with the goals of our personas. Suitable to all personas, large surface for quick visibility, and interactions, include social collaboration aspect. 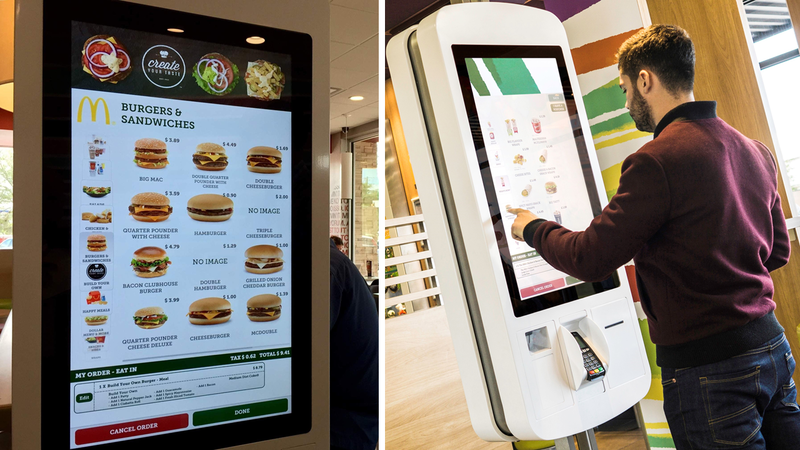 Not portable, require several such systems in tower dining and need to identify specific locations, long queue during peak hours. We decided to create low fidelity designs of large screen display as it suits the requirement of 3 personas. 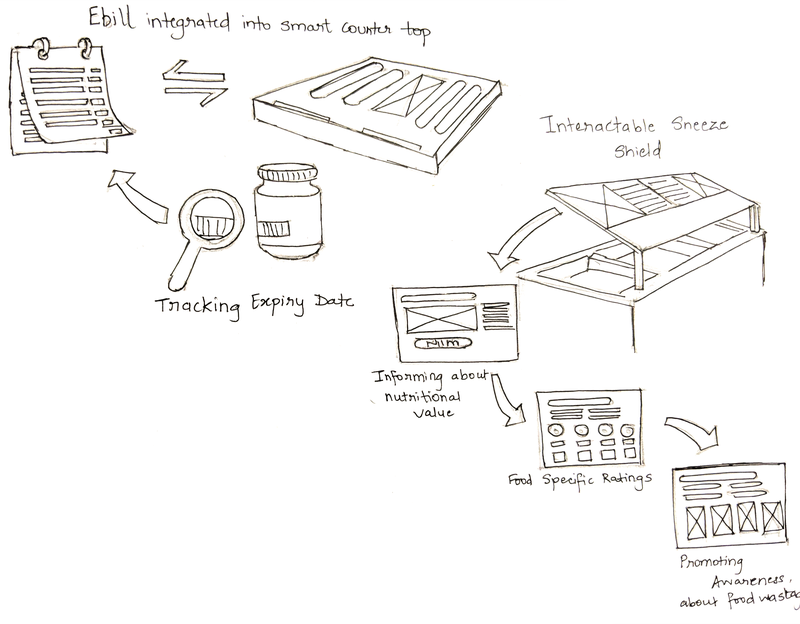 We kept on ideating on how the system could achieve efficiency in delivering the best solution for preventing food wastage. 1. Student can select maximum two menu items from the range of cuisines available at Tower dining. 2. 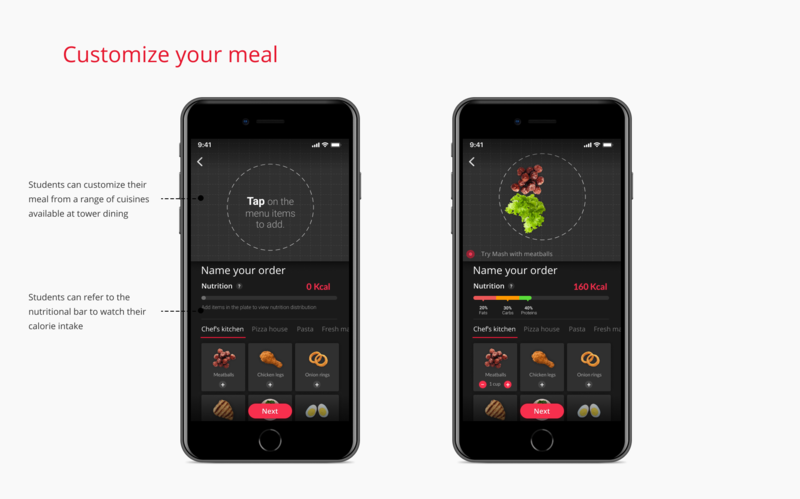 Students has to change menu items frequently for adding meal from another category. 3. Large-scale hand gestures can be used to drag food items from menu to plate causing physical discomfort and may result in Arm fatigue. 4. Students require personalized account to load their profile quickly. Good for made to order style dining. Results based on their preferences. 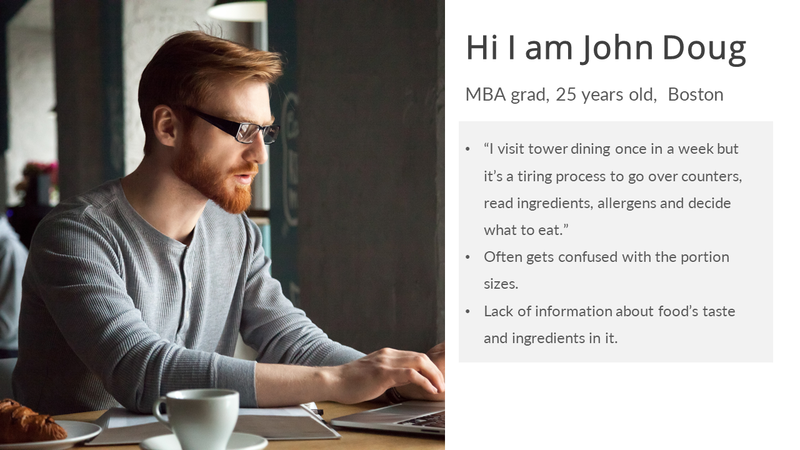 Rarely visiting personas found it useful and time saving. Estimated time indication prevented long queues. 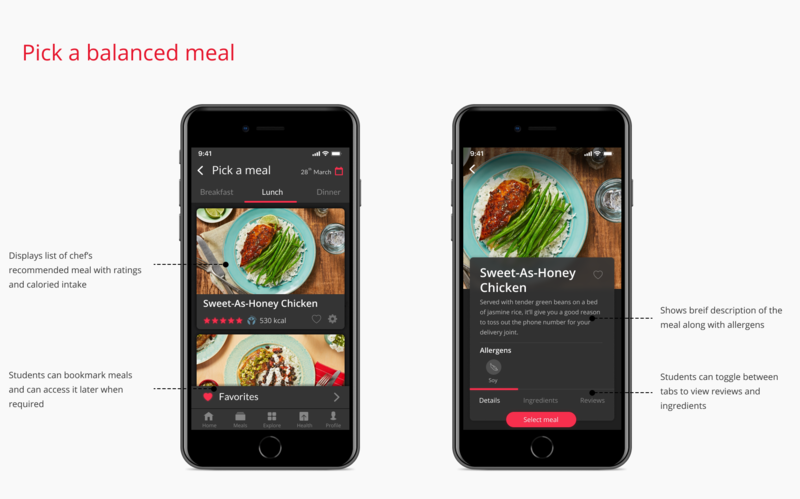 Chef can prevent overcooking with RSVP feature. 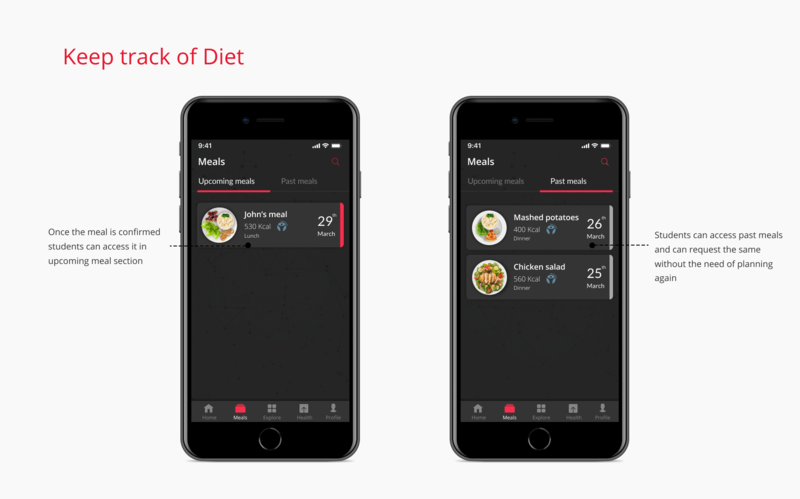 Privacy and easy integration with fitness and diet apps. Think about the Impact vs Efforts matrix when analyzing the solution. People act differently than what they usually say. 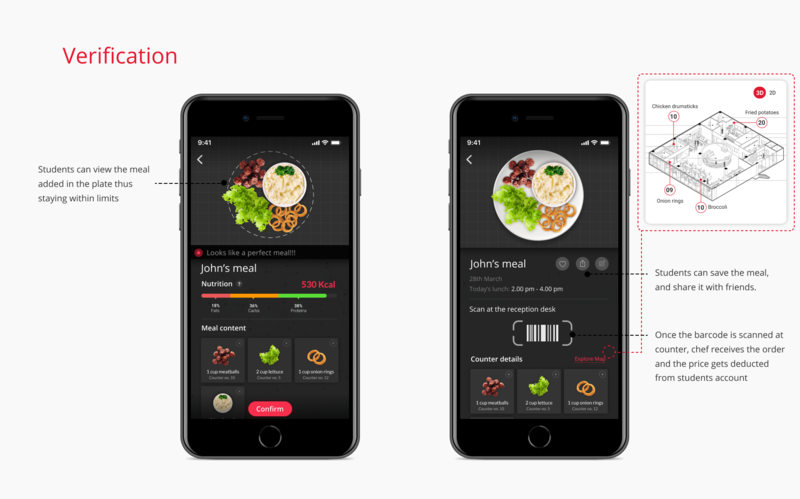 Visual design needs to be consistent and compatible across different devices.